In collaboration with UCA Canterbury, this year’s Urban Design Autumn School will be based at the Turner Contemporary in Margate. 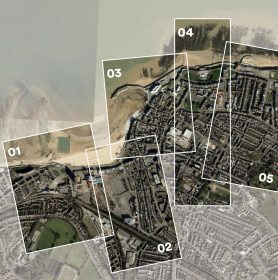 Confronting development pressures across Kent, and leading on from last year’s theme ‘Growing the City: Designing the Urban Edge’ this Autumn School will focus on strategies for densification of town centres, using Margate as a test bed for ideas. This will consider how new development can be positively integrated into an existing urban centre, and how this can help provide successful public spaces. Through the 2-day programme this KENT DESIGN event will introduce you to creating well designed, well connected and sustainable places that are sensitive to the surrounding urban fabric. Participants will work in small groups, with each taking an individual site spanning from the sea’s edge towards the town centre periphery. Each group will be mentored by leading urban design practitioners, there to help you in developing your own design proposals. This will take into account specific issues faced by Margate based on the recent increase in demand for development, considering issues such as the significant role of creative industries, responding the rich physical and cultural heritage of the town and strategies to deal with existing underused public spaces and buildings. Analyse site research to understand the challenges and outline key opportunities related to town centre densification and connectivity issues. The Autumn School package is inclusive of all workshops/seminars and lunch on both days but does not include overnight accommodation. There will be an early evening lecture on Thursday 21st September at the Turner Contemporary (included in the package price). All delegates will then have the opportunity to stay for an evening meal at a local restaurant (payable locally, not included in the package price). In delivering this Kent Design Autumn School, we continue to provide great training and value for money. However, hosting a 2-day learning event incurs costs over and above those associated with the normal training provision. To ensure we can offer great value for members seeking to secure places on the autumn school, Kent Design has developed a special subsidised members price for extra places. Kent Design members: A maximum of two free places per membership. Three or more places will be offered at a subsidised rate of just £95+Vat pp/per place. Kent Design members can email kentdesign@designsoutheast.org to book free and subsidised places. Please check with you KD representative prior to booking your place.